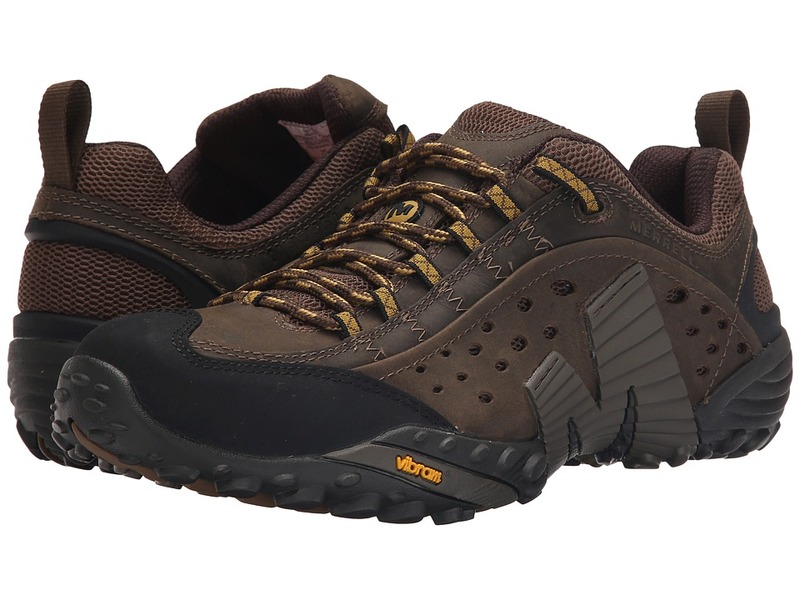 Ready for hiking, this shoe gives you the comfort you rely on. Leather and textile uppers add sophistication to rugged practicality. Leather and textile upper Breathable mesh lining Bellow tongue keeps out debris Merrell M Select FIT.ECO blended EVA contoured footbed with organic odor control Merrell air cushion in the heel absorbs shock and adds stability with an EVA midsole for cushioning Molded nylon arch shank Weight: 1lb 9oz. The mid-height version of the Merrell endless summer essential for trail, bike and hike. Extra support around the ankle without compromise of the hyperventilating mesh upper due to trimmed down but efficient Dura leather strapping. Vibram Multi-Sport Plus sole contains TC5 rubber compound in traction zones for grip and durability. UPPER / LINING M Select DRY seals out water and lets moisture escape so you stay dry when you are on the move. Leather and mesh upper. Bellows tongue keeps debris out. Synthetic leather toe cap and heel counter. M Select fresh antimicrobial agents reduce shoe odor. Ortholite anatomical footbed MIDSOLE / OUTSOLE Molded nylon arch shank. Compression molded EVA footframe provides cushioning. Merrell air cushion in the heel absorbs shock and adds stability. 5mm sole lug depth. Vibram outsole. Weight 1 lb 15 oz. Moab Fst Hiking Shoe Leave the trailhead behind in the Merrell Moab FST hiking boot. Leather, mesh, and TPU upper materials. Bellows tongue helps keep debris out. Lace-up closure. Front and back pull tabs. Breathable mesh lining. 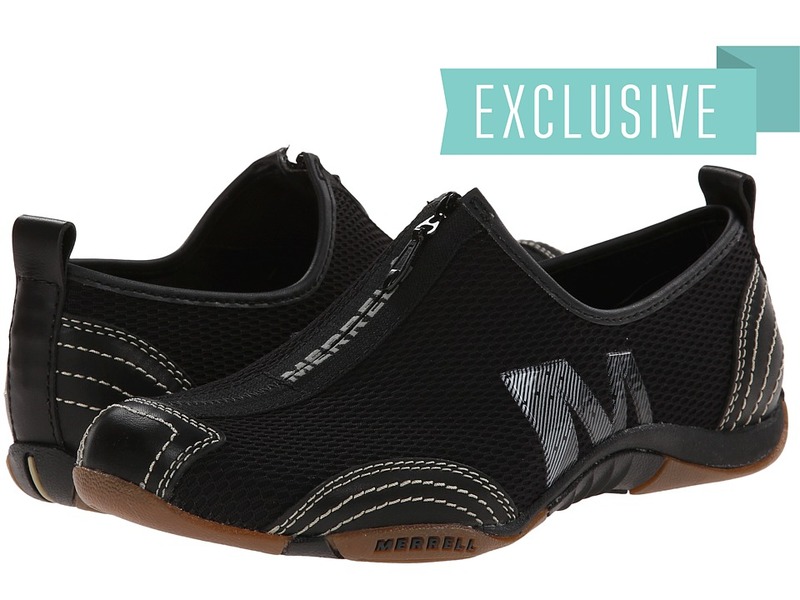 Merrell M SELECT FIT.ECO blended EVA, contoured footbed features organic odor control. Molded nylon shank adds arch support. Merrell air cushioning in the heel absorbs impacting shock and adds stability. Vibram MegaGrip outsole delivers an ideal combination of stickiness and durability for reliable traction on wet and dry surfaces. 5 mm lug depth. The new winterized Capra mid, now with waterproof leather uppers, will send you soaring up inclines and scrambling over snow and ice. Mesh lining. Merrell M Select FIT.ECO blended EVA contoured footbed with organic odor control. TrailProtect pad offers additional protection off road. Molded nylon arch shank. Merrell air cushion in the heel absorbs shock and adds stability. Sore feet? Not likely with our Phaserbound backpacking boot. On a long weekend expedition, protect your feet with cushioning where it counts. Merrell M Select FIT.ECO blended EVA contoured footbed with organic odor control. Vibram TC5 outsole. Keep your signature trail-ready look in the street-ready silhouette in the Merrell Brevard slip-on. Easy slip-on closure. Nubuck leather uppers. Side goring panels allow for an easier entry. Padded collar. Breathable fabric lining features antimicrobial M Select FRESH technology. M Select MOVE footbed. EVA midsole provides stability and comfort. Molded nylon arch shank. M Select GRIP delivers durable traction and grip. All Out Blaze Vent Mid Waterproof Hiking Boot Drizzle or shine your hike is a go in the Merrell All Out Blaze Vent Waterproof shoe. M SELECT DRY technology delivers waterproof, moisture-wicking protection. Waterproof leather and mesh upper materials. Bellows tongue helps keep debris out. Lace-up closure. Molded TPU external heel counter adds stability. Heel pull loop. Plush tongue and collar. Breathable fabric lining offers a great in-shoe feel. Molded foam footbed. Soft E-Foam midsole with I-Tech harder top sheet. Midsole Height:Heel/Toe: 14 mm/8.5 mm Differential: 5.5 mm Vibram TC5 outsole with 5 mm hollowed lugs for reliable traction over mixed terrain. UPPER/LINING Synthetic leather and mesh upper. Lycra and neoprene stretch collar for easy on and off. Injection molded TPU rear foot stabilizer. Synthetic leather toe bumper protection.Hydro drainage/ventilated footbed with Etc. Anti-Friction Lining treated with antimicrobial solution. MIDSOLE/OUTSOLE Molded Nylon arch shank. Merrell air cushion in the heel absorbs shock and adds stability. 3.5mm lug depth. Vibram outsole. Water friendly non-marking siped sole. Vegan friendly footwear. 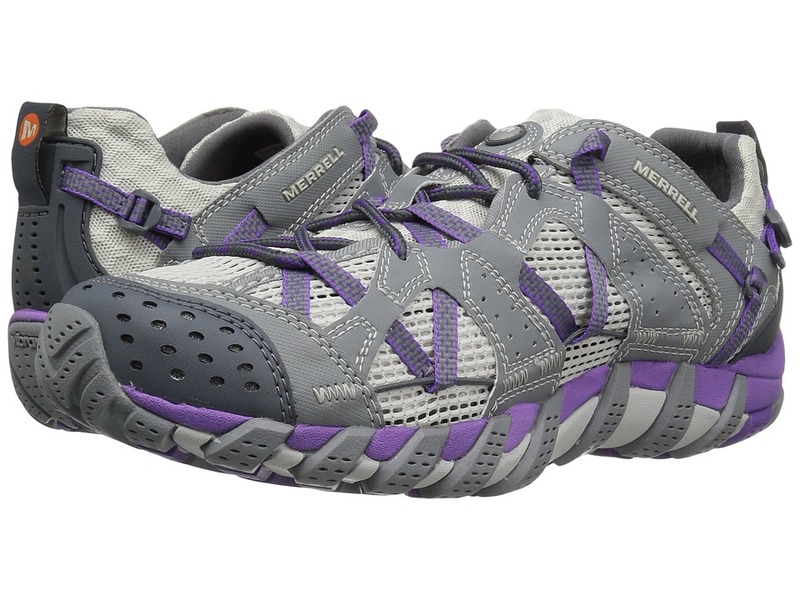 The ~Intercept~ lace-up from Merrell is a multi-sport shoe with a sculpted low cut and molded protection. Pigskin leather and nubuck upper with a breathable padded tongue. Polyester mesh lining treated with Aegis antimicrobial lining to keep your feet healthy and odor free. 4.5mm anatomical footbed with In-Board compression-molded EVA footframe and nylon 6.6 injection-molded arch shank. Merrell Air Cushion midsole and Axis Vibram sticky rubber outsole with 4.5mm lug depth. Slip lasted construction. Measurements: Weight: 1 lb 2 oz Product measurements were taken using size 8.5, width M. Please note that measurements may vary by size. Weight of footwear is based on single item, not the pair. Ideal for those who need high-function footwear that can stand up to the rinse cycle, the ~Waterpro Maipo~ from Merrell runs fast wet or dry. Synthetic leather and ventilated mesh upper with micro mesh free flowing drainage ports. Lycra and neoprene padded tongue and collar and dynamic lacing system. Synthetic leather toe bumper with integrated drainage ports and injected-molded TPU rear foot stabilizer. Hydro drainage/ventilated footbed with Etc anti-friction lining treated with Aegis antimicrobial technology. Merrell Air Cushion midsole with nylon 6.6 injection-molded arch shank. Water-friendly, non-marking, razor-cut siped Vibram Water Pro TC5+ rubber outsole with 3.5mm lug depth. Slip lasted construction. Vegan friendly. Measurements: Weight: 11 oz Product measurements were taken using size 8, width M. Please note that measurements may vary by size. Weight of footwear is based on single item, not the pair. 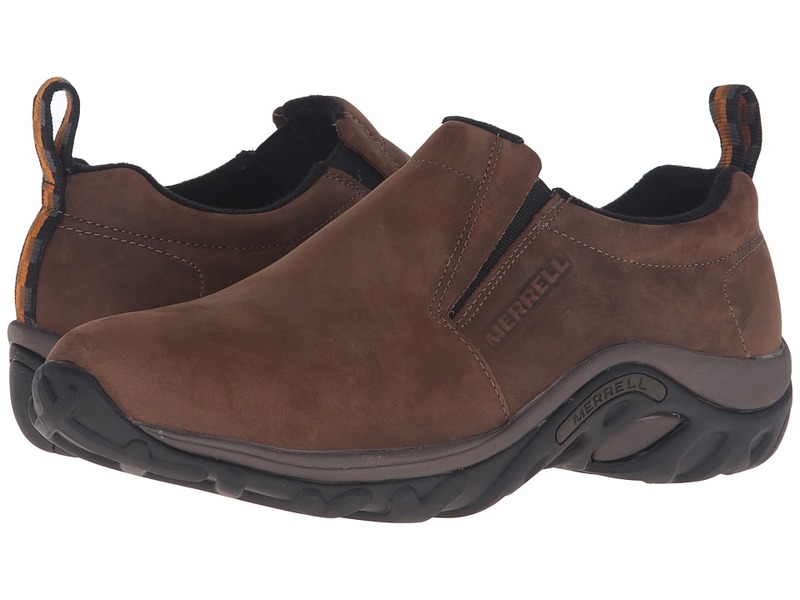 Energetic, playful and sporty footwear makes a comeback with the Barrado slip-on from Merrell&amp#174. Mesh upper with leather trim for an athletic appearance. Smooth mesh linings provide enhanced breathability to keep your feet dry. 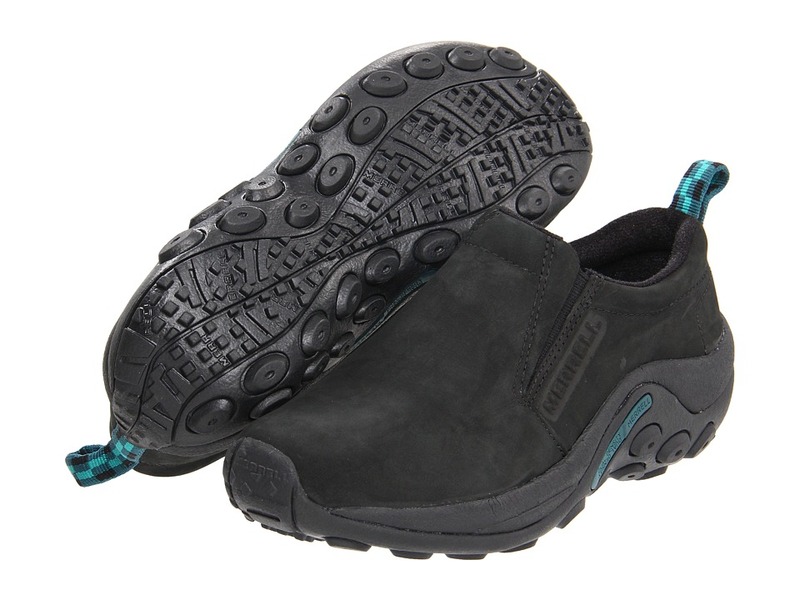 Compression molded EVA wedge features Merrell Air Cushion for all-day comfort. 4.5mm anatomical Cita-XY footbed with Q-Form technology is treated with Aegis Antimicrobial Technology. Merrell Pacific rubber outsole has 360&amp#176 siping for slick-surface grip. Slip lasted construction. Measurements: Weight: 6 oz Product measurements were taken using size 7, width M. Please note that measurements may vary by size. Weight of footwear is based on single item, not the pair. 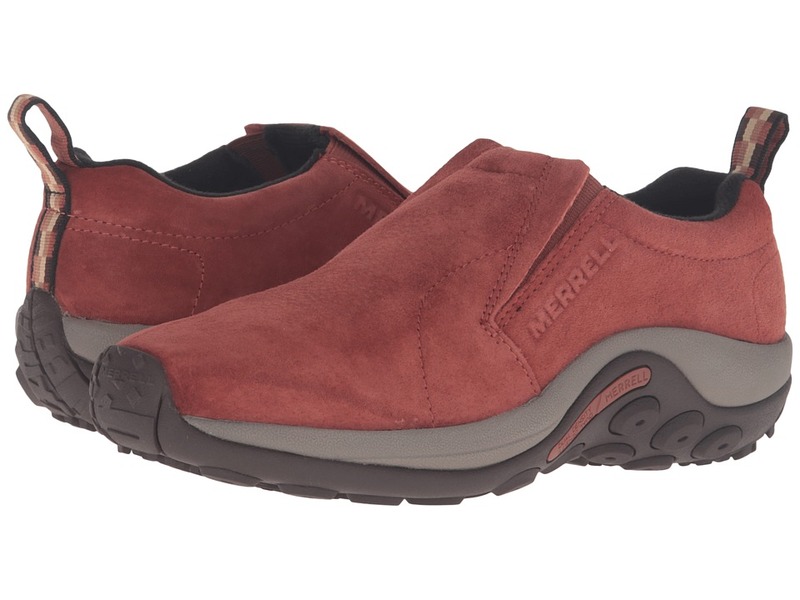 The ~Jungle Moc Leather~ from Merrell is ideal for aftersport comfort. Full grain leather upper with Lycra and neoprene four-way stretch collar. Pigskin lining treated with Aegis antimicrobial technology to keep your feet healthy and odor free. 4.5mm OrthoLite anatomical footbed with compression-molded EVA footframe and nylon 6.6 injection-molded shank. Merrell Air Cushion midsole and Jungle Maze sticky rubber outsole. Slip lasted construction. Measurements: Weight: 15 oz Product measurements were taken using size 10, width M. Please note that measurements may vary by size. Weight of footwear is based on single item, not the pair. The Jungle Moc slip-on from Merrell is ideal for outdoor enthusiasts seeking an easy-on, supportive and comfortable shoe. Uppers are made from either suede pigskin or textile materials (depending up on color selected) . M Select FRESH odor-fighting technology helps keep feeling fresher longer. Molded foam insole offers light underfoot plush. Compression-molded EVA footframe for enhanced cushioning. Merrell Air Cushion in the heel provides shock absorption and stability. Molded nylon arch shank. M Select GRIP outsole delivers reliable traction and grip. Imported. Measurements: Weight: 11 oz Product measurements were taken using size 9, width M. Please note that measurements may vary by size. Weight of footwear is based on single item, not the pair. 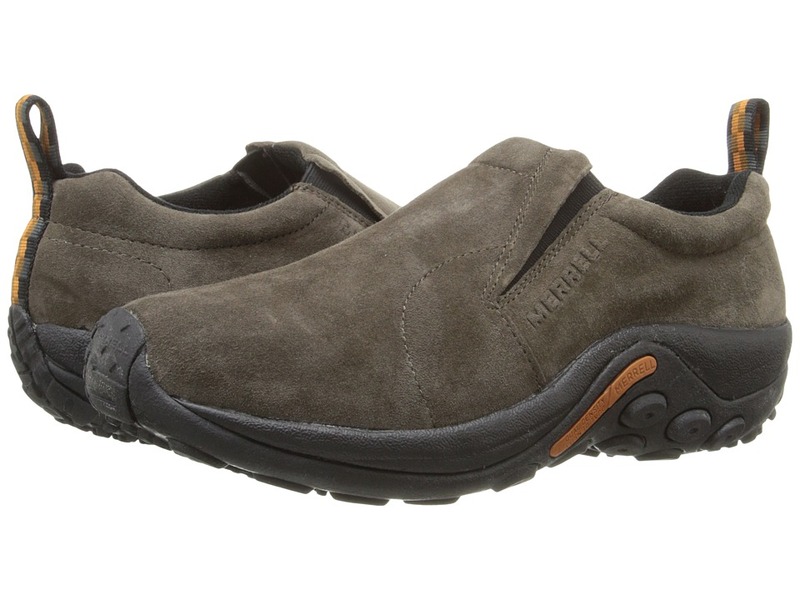 The athletic ~Jungle Moc Nubuck~ from Merrell offers both comfort and performance. Nubuck leather upper with dual instep goring for a secure yet flexible fit. Heavy Nylex lining treated with Aegis antimicrobial technology to keep your feet healthy and odor free. 4.5mm OrthoLite anatomical footbed with compression-molded EVA footframe. Merrell Air Cushion midsole absorbs shock and offers all-day support. Outsole will vary between Jungle Runner or Jungle Maze sticky rubber outsole. Slip lasted construction. Imported. Measurements: Weight: 14 oz Product measurements were taken using size 8.5, width M. Please note that measurements may vary by size. Weight of footwear is based on single item, not the pair. The Jungle Moc slip-on from Merrell is ideal for outdoor enthusiasts seeking easy-on, supportive, and comfortable shoes for use after a day on the trail. Water-resistant pig suede or leather upper with dual instep goring for a secure yet flexible fit. Slip lasted construction. Soft pigskin lining for a comfortable fit. 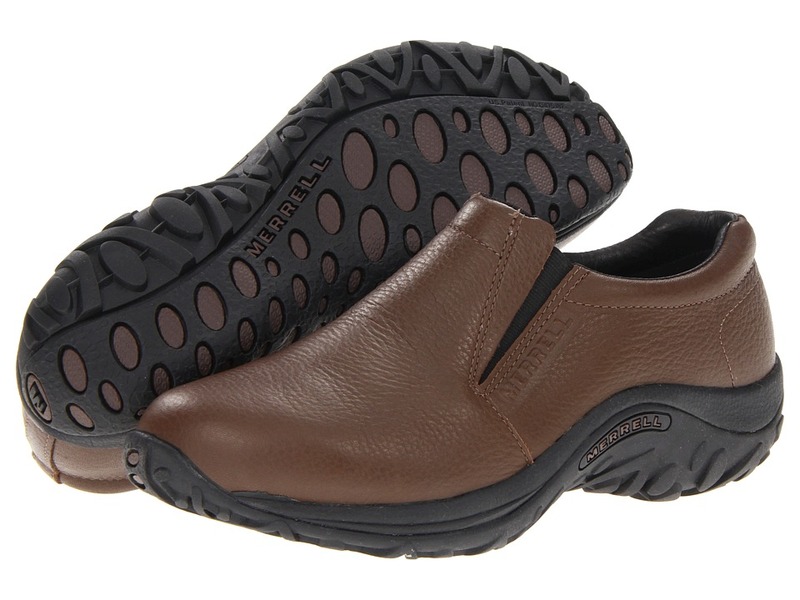 Merrell M Select&amp#8482 FIT.ECO blended EVA contoured footbed with organic odor control. Merrell air cushion in the heel absorbs shock and adds stability. Compression-molded EVA foot frame provides cushioning and added comfort. Molded nylon arch shank. Durable rubber outsole with pronounced lug pattern for excellent traction. Imported. Measurements: Heel Height: 1 1 2 in Weight: 12 oz Product measurements were taken using size 8.5, width W. Please note that measurements may vary by size. Weight of footwear is based on single item, not the pair.